This bag is like a quilted, patent leather style fabric. The bright teal color doesn't really scream fall to me but the theme of this bag is Beauty Candy so the quilted style of the bag and the color is quite fun to go with the theme. Unlike many of the other bags I've recieved this one is actually lined, which is very nice. Gives it a bit more substance. Skyn Iceland Glacial Clansing Cloths, Ecru New York Acacia Protien BB Cream for Hair, NYC Big Bold Curl Mascara, Starlooks Gloss in Guilty Pleasure, Figs and Rouge Hand Cream. Redeemed with Points - Milani Bella Eyes eyeshadow set. I have to say I wasn't too pleased with this months samples. First off, getting a full sized drug store mascara isn't really want I wanted to get, nor what I expected to get. This NYC mascara is $4.99 at CVS and actually readily accessible by me. I usually expect to get products that are new or interesting that I might not be able to get my hands on everyday. The teeny, tiny Starlooks lipgloss sample is just rediculous. Now, the actual formula is rather nice and I might just throw it in my purse but the size is crazy tiny. Again, not what I expected from my Ipsy bag. The facial towlettes are always handy and it's nice to have a spare package. The hand cream will probably go in my bag as well and it's really smooth and hydrating. A nice sized sample in my opinion. Another decent sized sample is the Ecru New York BB Cream for your hair. I like that it is color safe as I just dyed my hair but still need some hydration. I am so very glad that I had points to redeem this go round because the only thing I was really excited about was getting the new Malani Bella Eyes eyshadows. The set of three colors Bella Ivory, Bella Gold, and Bella Espresso (review coming soon!) were available so I snatched up the set because I didn't know if these eyeshadows were really worth it. I am so very thankful for every one that signs up for Ipsy with my link - these points allow me to try things I wouldn't neccessarily try to review for you all!! This is probably one of two or three total bags I haven't been 100% pleased with but sometimes that is the luck of the draw. 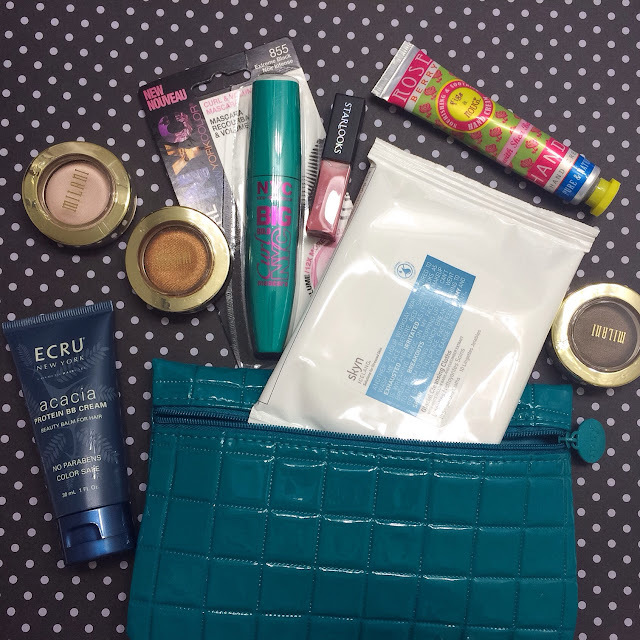 If you'd like to sign up for Ipsy, please click here.